Our story starts when Lobina Transport’s owner Simon Lobina was a teenager, working for pocket money helping his father make deliveries in the family food and wine business. Simon’s father Gino, who had moved to England in the 1960s, was importing quality Italian produce including olive oil, salami, pasta, tomatoes and wine and selling and delivering it to Italian families who had made their home in the Midlands and the North of England. These families missed the unique taste of home and visits from Gino Lobina’s delivery drivers were eagerly anticipated. The foundations for Lobina Transport’s unique vision and values were laid here. 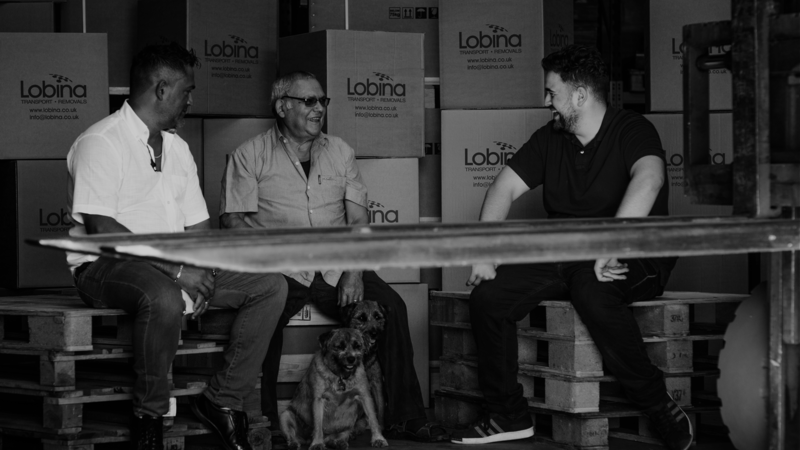 The business thrived because of the long term relationships the Lobina family forged with the Italian community across the UK. Loyalty, reliability and honesty were their watchwords. Soon they were being asked to deliver parcels, arrange removals of furniture and many more transport jobs between Sardinia, Italy and the United Kingdom. In 1986, after leaving school at the age of 16, Simon looked round for an opportunity to make more money. He landed a job with a major insurance company, but after only three days realised that this wasn’t the career path he wanted to take. Instead he decided to use his passion for building a rapport with people to become a salesman for a well-known vacuum cleaner company. He was regularly the top salesman despite making the least appointments of any of the sales team. In fact, aged just 17, Simon broke the company sales record. He was still helping out with the family transport business and aged 18 he passed the Certificate of Professional Competence for National and International Road Haulage with flying colours despite being the youngest in the group. Persistence is another quality that Lobina Transport prizes and Simon showed tenacity when it came to driving. Ironically for a man whose careers has been built around transport, it took him three attempts to pass his ordinary driving test at 17 and seven attempts to get his Class 1 HGV licence at the age of 21. After this, Simon hit the roads, constantly travelling between the UK and Italy building up first-hand experience of the transport business. He also worked as an agency driver between trips for the family business. He developed a specialist reputation for being the person companies called in a crisis when they needed help with time and mission-critical deliveries – and so was born another element of expertise that sets the modern-day Lobina Transport apart from its competitors. Simon came to see that there was always going to be a cap on how much he could earn as a lone driver, and with a wife and a young family to support he began to think about the next stage of his business journey. In the summer of 2001, after 10 years of driving, Simon was involved in accident – not his fault – in which someone lost their life. This left him very troubled and no longer willing to be out on the roads as a driver. It was time to use the experience he had gained to direct transportation and logistics operations. He began to work alone out of a small flat above his mother’s shop. He organised and commissioned other drivers to move domestic loads and transport the shipments he used to drive himself. At this stage, 99% of his business was still between Italy and the UK. As the business grew, Simon moved in to his first office in Orston, Nottinghamshire, working in collaboration with two other companies that specialised in imports and IT. “I learned a lot at this time. One of the most valuable lessons, which I instil in my employees today is that you don’t turn down a plan unless you have a good reason and an alternative way of doing it,” said Simon. In 2004, Simon registered the domain name Lobina.co.uk – a sign of things to come. Lobina Transport Services became a Limited Company the following year and Simon moved out and onwards to employ his own staff at new premises in Trowell. In 2007 came another move to Webster’s Yard in Ilkeston, to accommodate new staff and bigger warehouse facilities. The Lobina team now had eight employees. Just when things were going well, the 2008 global financial crisis hit. Many of Lobina’s clients went bust, leaving Simon owing huge debts to his suppliers. Simon needed to make changes and so he laid-off five staff taking costs down to the bare bones to ensure the company survived. His hard work paid off as he slowly but surely wiped out his debt and got back on the road to growth. The first family member to join Lobina in 2009 was 17-year-old Niko Lobina, Simon’s nephew. He had no experience in the transport business but was hungry to learn. In the same year, Simon’s son, Luigi, left school and joined the company. Following the financial crash, Simon saw the potential for Lobina to focus on the niche area of time-critical transport. He also benefitted from the values he had always promoted of honesty and high quality service and communication. “If a delivery is going to be late, despite everything you have put in place, and nothing can alter that you have to be upfront and honest with the customer. Lies and excuses don’t wash,” said Simon. After the UK voted to leave the EU in the 2016 referendum, Lobina opened an office in Poland. It launched with one employee and now has a staff of seven. In the same year, Simon launched Lobina Premium an extension of the company’s services concentrating on bespoke solutions for high-end clients. In 2017 came the biggest step in the Lobina journey to date when the company moved to its current premises on Hallam Fields Road in Ilkeston. “We know we are only as good as our last job,” said Simon. “We focus on ensuring that we earn and keep the respect of our clients and we only employ people who share our values of honesty, persistence, a willingness to learn and an energetic passion for overcoming obstacles and finding innovative solutions. “We still really WANT the business and that hunger to win fires us up every day. Simon’s enthusiasm is contagious and it’s clear that after his father gave him a start in business in the 1980s he was a natural at earning people’s trust and delivering the best customer service possible. Today, the three generations of the Lobina family, Gino, Simon and Luigi continue to shape the exciting future that lies ahead for this exceptional family firm. We have never failed to meet a transport challenge, no matter the size, weight, delicacy or timeframe. This is mostly because we have that ‘family’ touch, where our staff and partners are loyal, dependable and tightly connected. If there’s ever a problem, we work around the clock to sort it. Everyone in the Lobina office has an awareness of every job, and it’s status at any given time. Oversees Lobina’s unbeatable customer service and ensures the day-to-day business runs smoothly and efficiently – while handling the major strategic decisions that ensure the business continues to develop and thrive. Expertly dealing with business development and strategy, and managing the business’ accounts. Customer satisfaction is what drives Luigi. His expertise focuses on making sure existing customers continue to love what we do for them, and continuously attracting new clients. Dealing expertly with complex and timely transport needs, and keeping clients fully up to date with consignments’ progress. Controls the advertising budget and manages Lobina’s brand image and communications. Keeping existing clients happy, and attracting new ones. Manages the smooth running of warehouse goods and storage operations. Ensures everything keeps moving along nicely, and that everyone gets paid on time. Szymon manages sales and operations at Lobina’s new Polish branch and ensures the day-to-day business runs smoothly and efficiently.